I mention this for two reasons: 1) I think it’s interesting how reading evolves when you start reading like a writer; and 2) I want to highlight just how difficult it is for a book to stand out for me. I was watching this documentary the other day about the working ways of some of the big-name artists in Manhattan around 1970. One of the things that stood out for me was how casually they talked about their excursions to see the work of other artists. They were willing to drop everything to go see something that might be good and interesting and inspirational and innovative. Basically, they never stopped searching and learning. Yet, they talked about this as part and parcel of being an artist. Some books do stand out. It’s often the ones that I already foresee as promising- usually by authors with whom I am familiar. I don’t mean that I only know their name, which was the case with Lethem. 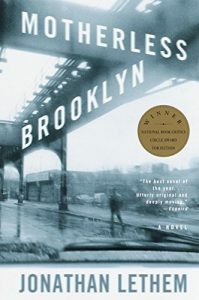 But, Motherless Brooklyn has somehow boggled me. I love every minute spent with it. And I strongly suspect other people will feel differently (despite the acclaim that it received), which is fine. Moreover, I haven’t finished it yet, which is a first for this series. For all I know, it will just peter out and I’ll be shrugging about this book next week. I very much doubt it, because it has already seeped into my subconscious. Right now, this is a top five novel for me. That’s when someone asks you how much you like it and you say “Top 5” and they ask what the others are and you say, “Well, Martin Chuzzlewit is number one” and then you rattle off a couple others that you think they might like or at least not lose respect for you for liking. You’ve Got to Check This Out is a blog series about music, words, and all sorts of artistic matters. It started with an explanation. 34 more to go.